We love Beef but I try not to have it very often as everybody knows that eating Red-Meat isn’t healthy. Try to reduce consuming Red-Meat only once a week should be OK … I guess. 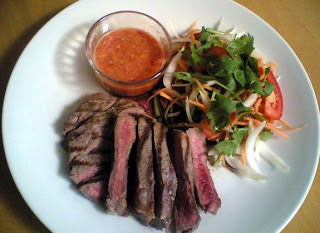 Grilled Beef Salad is one of my most favourite dishes and this particular dish has become my signature dish. Almost every time I hosted dinner parties at home, my mates always asked for it. 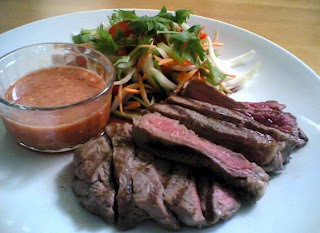 Remarks: you can mix and toss everything (Grilled Beef, Salad and Dipping Sauce) in a salad blow and then serve in a plate as how Thai normally like to cook/do it but I like mine served as shown in the picture.